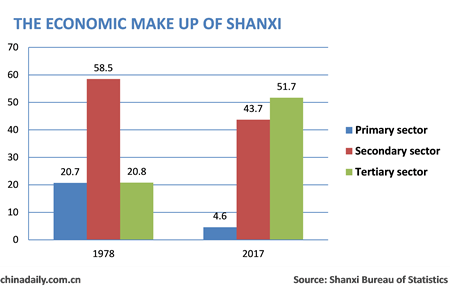 Shanxi's economy has ballooned in size and undergone wholesale reform over the past four decades. Its GDP increased to 1.55 trillion yuan ($229.9 billion) in 2017 from 8.8 billion yuan in 1978. The tertiary sector now makes up the lion's share of local GDP, accounting for 51.7 percent in 2017, an increase of 30.9 percentage points compared to 1978. In addition, the non-public sector has gone from strength to strength, with private firms initially involved in coal mining, coking and smelting, before the emergence of the high-end manufacturing firms that drive the provincial economy today. 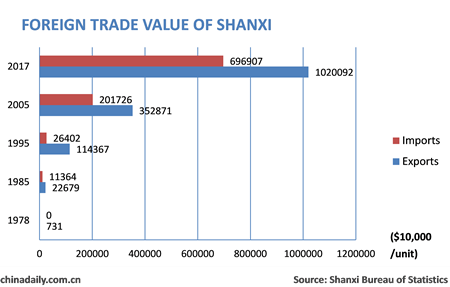 Shanxi is a vital national energy supplier. And since 1978, the province has been one of the top two national energy suppliers, with a cumulative production total of 17.19 billion tons. Meanwhile, the province has continued to accelerate its opening up to the outside world. By the end of 2017, the province had trade links with 27 countries on five continents. Indeed, its foreign trade volume increased from $350 million in 1990 to $17.17 billion in 2017. 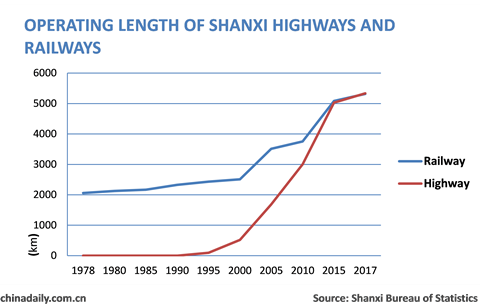 Shanxi has also made big advances in building transport and communication infrastructure. Its highway mileage reached 143,000 kilometers in 2017, 4.5 times that of 1978, and the railway mileage reached 5,316.8 km, 2.6 times that of 1978. The province has formed an air transportation network with seven airports. Mobile phones and internet broadband have gone from being a luxury in the 1990s to being essential "must-haves" today. People's living standards have also greatly improved, with per capita disposable income of urban residents in the province rising from 301 yuan in 1978 to 29,132 yuan in 2017, and that of rural residents from 102 yuan to 10,788 yuan. Residents are also increasingly well cared for, with improved access to education, better insurance coverage and modern healthcare. Despite its striking socioeconomic changes, Shanxi is committed to preventing, controlling and managing atmospheric, water and soil pollution and promoting afforestation. As a result, over the past four decades the forest coverage rate has increased from 10.3 percent in 1978 to 20.5 percent in 2017. Regional GDP was 8.8 billion yuan ($1.27 billion) in 1978, 107.63 billion yuan in 1995 (exceeding 100 billion yuan for the first time), and 1.13 trillion yuan in 2011 (exceeding 1 trillion yuan for the first time). The province reported a GDP of 1.55 trillion yuan in 2017, 176.5 times larger than that of 1978, and the average annual growth rate amounted to 9.6 percent. 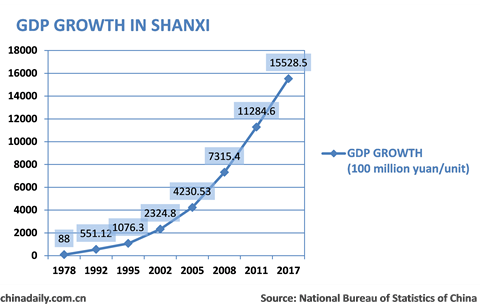 And per capita GDP increased from 365 yuan in 1978 to 42,060 yuan in 2017. The proportion of the primary, secondary and tertiary sectors of the economy changed from 20.7:58.5:20.8 in 1978 to 4.6:43.7:51.7 in 2017. The tertiary sector has become an increasingly important factor in the province's economic growth. In 2015, the sector exceeded the secondary sector in terms of its contribution to regional GDP for the first time, making it the province’s largest sector. In 2017, it accounted for 51.7 percent of regional GDP, an increase of 30.9 percentage points over 1978. The total mileage of transportation routes increased from 32,000 kilometers in 1978 to 148,000 km in 2017, with an average annual increase of 4.1 percent. The number of civil airports has also increased from just one in 1978 to seven in 2017, with more than 223 air routes now offered to 136 cities. In 2017, the number of mobile broadband users reached 28.94 million; the number of users with access to internet broadband reached 8.73 million –– 12,001 times greater than in 1997, when the internet had just become available in the province. By the end of 2017, Shanxi had established trade relations with 27 countries on five continents.Its import-export volume in 2017 reached $17.17 billion, 49.1 times higher than the $350 million of foreign trade recorded in 1990. The ratio of high value-added products as a proportion of exports continued to increase with machinery, electronics, electrical equipment and parts accounting for 62.1 percent of total exports in 2017. Since Datong city in Shanxi province became sister cities with Japan's Omuta city in 1981, the province has established relations with 43 cities from 19 countries. 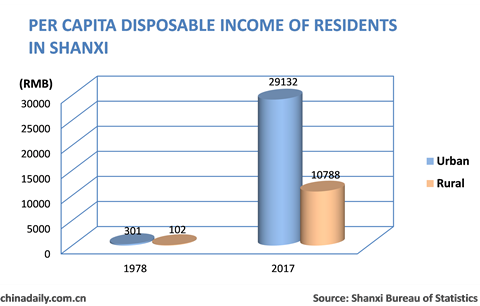 The per capita disposable income of urban residents in Shanxi province increased from 301 yuan ($43.36) in 1978 to 29,132 yuan in 2017, 96.7 times more than that of 1978. The per capita disposable income of rural residents increased from 102 yuan in 1978 to 10,788 yuan in 2017, 105.8 times more than that of 1978. The consumption structure has undergone fundamental changes, from single household daily consumption to multi-level consumption such as consumption in culture, education, tourism, healthcare and housing. In 2003, the province's investment in pollution control was 3.20 billion yuan ($460.97 million), accounting for only 1.30 percent of GDP that year; but investment grew to 52.57 billion yuan in 2016, accounting for 4.03 percent of GDP that year, ranking it first among 31 provinces, autonomous regions and municipalities. 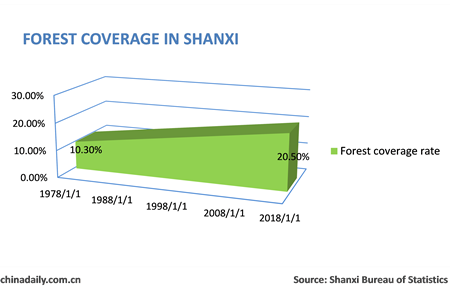 As for afforestation, the forest coverage rate in Shanxi has increased from 10.3 percent in 1978 to 20.5 percent in 2017, with forest coverage increasing by 2.396 million hectares. A total of 45 nature reserves covering 11,000 square kilometers have also been established.